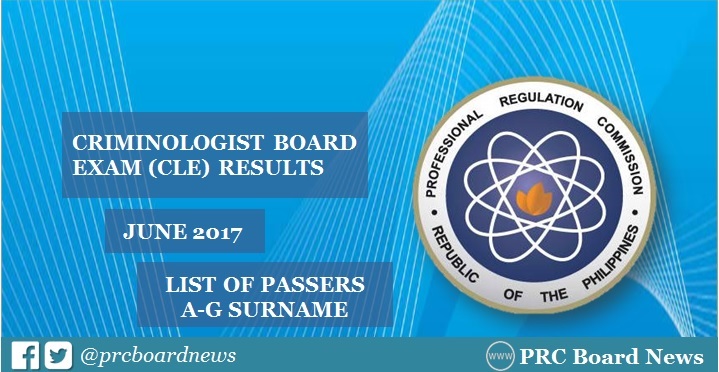 MANILA, Philippines - The official results of June 2017 Criminologist Licensure Exam (CLE) or Criminology board exam, including the alphabetical list of passers were released online today, June 30 or in twelve (12) working days. Check out on this page for A-G Surnames. The examination was conducted on June 11, 12 and 13 (Sunday to Tuesday) in Manila, Zamboanga and all regional offices nationwide. The members of the Board of Criminology who gave the exam are Hon. Ramil G. Gabao, Chairman; Hon. George O. Fernandez and Hon. Ruben A. Sta. Teresa, Members. Acording to PRC, registration for the issuance of Professional Identification Card (ID) and Certificate of Registration will be done on-line. Visit the official website of PRC (www.prc.gov.ph) and follow instructions for initial registration.